This Vince Camuto bootie is my go-to style for cropped jeans, dresses and skirts. I love the cut out detail and the sale price is right! I have this F.P. dress in blue and I love it. It is so comfortable and flattering. The ivory is great for summer but would also look fabulous with the above booties and a leather or denim jacket for fall. Natori makes really great fitting bras. This is the time to grab a couple of them because they rarely go on sale. I have this one and it fits great but most of all, it's comfortable. It's no secret that I love my Spanx faux leather leggings and now you can get them on sale!!! All sizes are still in stock so grab them now. I wear a size small for reference. 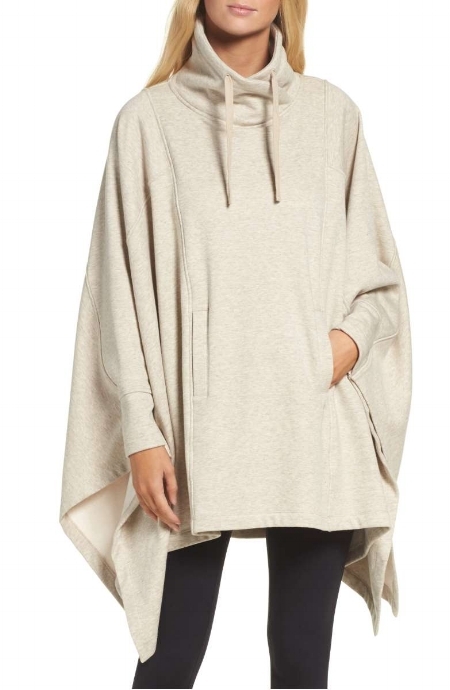 I am obsessed with this poncho. Would be perfect for those chilly soccer games. This dress is screaming my name. Would look great with booties or tall Frye boots in the fall. It's killing me to even discuss the cooler weather but the clothing is always SO GOOD come fall. Switching gears...if you need some quality denim for your little man, Tucker + Tate makes the best I've found. My son loves these jeans and I always buy two or three pair when they're on sale. I wish they made this jacket in my size. It screams, I just threw this on with black leggings and still look cool. My daughter will be sporting it for sure. These candles smell amazing and look pretty on your counter. This is a great deal for three. You could even split them up and gift them.